Don’t forget! Cow Appreciation Day at Chick-Fil-A is July 13th, 2012. 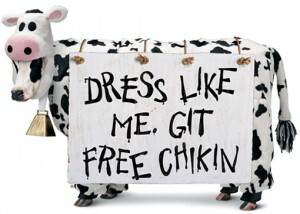 Stop in dressed like a cow and you will get a FREE Chick-Fil-A Combo Meal. If you prefer to go partially dressed like a cow you will get a FREE entree. There is plenty of time to come up with a costume, but if you need some help there is a Cow Starter Kit available here.